Minelab GPX 5000 Gold Detector with FREE Pro Package! 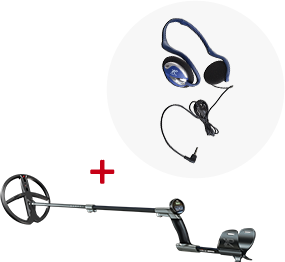 MINELAB GPX 5000 GOLD DETECTOR PRO PACKAGE WITH SPECIAL DISCOUNT PRICING! GPX 5000 disponible con cambio manual en el lenguaje español! The GPX 5000 sets the new benchmark in gold detecting technology. With an amazing range of features and functions the GPX 5000 is in a class of its own. Featuring Minelab's exclusive technologies, Multi Period Sensing (MPS), Dual Voltage Technology (DVT) and Smart Electronic Timing Alignment (SETA), the high performance GPX 5000 is capable of finding more gold than ever before. From sub-gram nuggets to the elusive 'retirement nugget' and everything in between, with the GPX 5000, you can find it. new Timings: Coin/Relic, Salt/Gold and Fine Gold. thought to be completely worked out! Modes can also be renamed. Tracking, Tracking speed, Ground Balance Type, Quick-Trac button). Signal Peak, Response, Target Volume, Volume limit, Stabilizer). Motion control, adjustable to match your sweep speed and optimize target responses. an adjustable timeout to help preserve battery power. Two coils as standard: 11” DD coil plus 15x12” Mono loop coil giving you added versatility and value. Plus a $400 Pro Pack! Notify me of updates to Minelab GPX 5000 Gold Detector with FREE Pro Package!